The release of “Beyond the Hype: The Hard Work Behind Analytics Success,” a study by the MIT Sloan Management Review and SAS Institute, reveals a significant and continued decline in the percentage of organizations reporting gained competitive advantage from analytics. Despite the decline in competitive advantage, most managers are still optimistic about the potential of analytics within their company. The MIT Sloan Management Review started its study on analytics and competitive advantage six years ago. Throughout those six years, the study has revealed a magnitude of change in the reported competitive advantage created by analytics within corporations. After a steady incline in the first years of the study, the percentage of managers who reported a competitive advantage from analytics reached a high of 66 percent in 2012. Since 2013, when the incline flattened, it has continued to decline significantly to 51 percent of survey respondents who stated analytics create competitive advantage for their organization in 2015. The study attributes this decline to the increase of analytics usage and availability within the market, which “levels the playing field” and makes it more difficult for companies to keep an advantage. In the past, the use of analytics was a competitive advantage in itself, but now it is more often viewed as a necessity. While the popularity and adoption of analytics within the corporate landscape continues to grow, so does the volume and complexity of data, and because of these factors, competitive advantage created from analytics is difficult for many companies to achieve. Many organizations recognize the value of data, but do not identify where and what data exists in their organization because it requires a large investment of time, finance, and leadership. In 2015, MIT Sloan Management Review and SAS Institute conducted research to glean further insight into what actions need to be taken to improve decision-making with analytics. After surveying more than 2,000 managers and interviewing more than a dozen global company executives, it was discovered developing an analytics strategy is a key component to success. The study found analytically mature organizations are five times more likely than analytically challenged companies to have a formal plan for the strategic integration of analytics within their business (See Fig. 1). 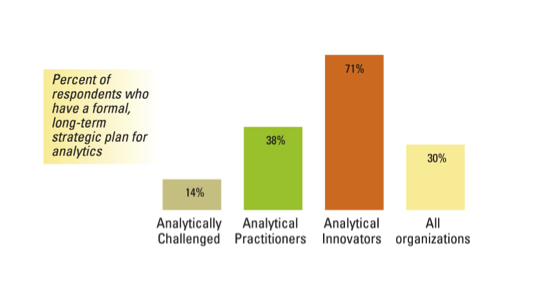 Organizations with formal analytics strategies should exhibit the following characteristics: rely on data to make strategic choices, use data to spark intuition and innovate new ideas, become familiar with new technologies to apply to the organization’s needs, and have executives who use analytics and are open to make changes from analytical insights. The most successful organizations strive to create a strong connection between their organizational strategy and analytics strategy. With the execution of this analytics strategy, organizational behavior will change, and may occur in many areas across the organization, such as exploring new markets, improving day-to-day operations, customer engagement, pricing, or fraud detection. Survey results imply organizations must commit to allow data to heavily change and influence the decision-making process within the organization. For more in-depth results, please read the 2016 report on data and analytics. 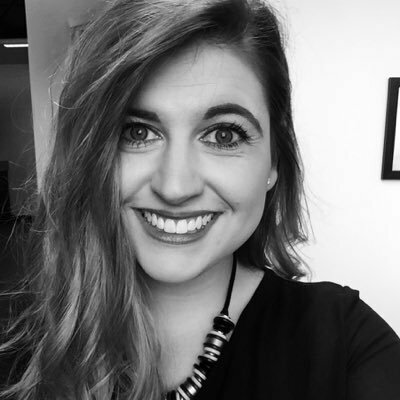 Mary Beth Perry is the former Research Assistant for IPR’s Social Media Research Center. Follow her on Twitter @MB_Perry.